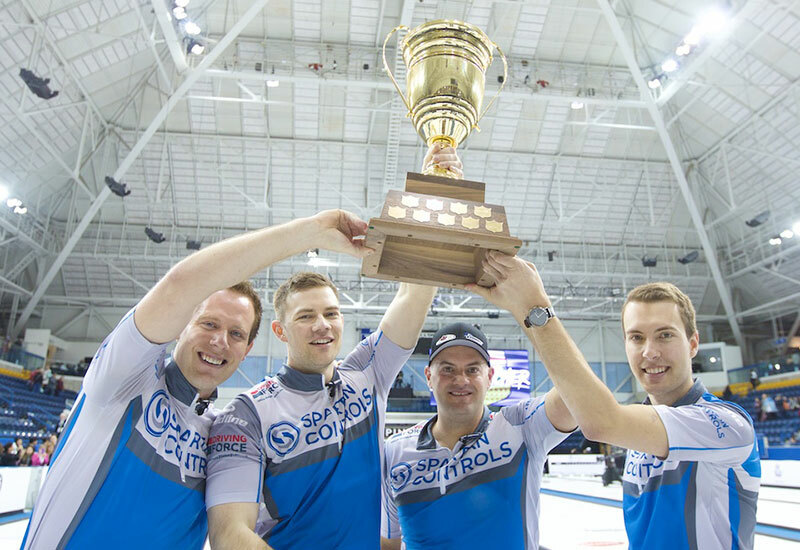 Brendan Bottcher (Edmonton, Alberta) wins the Players' Championship, defeating Kevin Koe (Calgary, AB) 6-1 in Toronto, Ontario at the Mattamy Athletic Centre in Maple Leaf Gardens. Bottcher with Darren Moulding at third, Bradley Thiessen and Karrick Martin on the front end take home the $30,000CDN first place cheque along with 85.362 world ranking points, while Koe receives $24,000CDN and 62.599 world ranking points for their second place finish. Bottcher opened the scoring stealing 1 in the first end after Koe attempted a tough shot for two. After a blank end, Koe was forced in the third end needing to make the double takeout to score. After another blank end, Bottcher scored a single the fifth end to extend the lead to 2-1. After 2 blank ends, Bottcher held off Koe for a steal of 4 in the eighth end and the 6-1 win. In the semifinals, Bottcher defeated Ross Paterson (Glasgow, Scotland) 7-4 and Koe defeated Peter De Cruz (Geneve, Switzerland) 9-8 in an extra end. De Cruz and Paterson earned $16,000CDN and 48.372 ranking points for their semifinal finishes. In the quarterfinals, Bottcher defeated Niklas Edin (Karlstad, Sweden) 7-5, Koe defeated Glenn Howard (Penetanguishene, Ontario) 7-3, while Paterson defeated Brad Jacobs (Sault Ste Marie, Ontario) 6-5 in an extra end and De Cruz defeated Brad Gushue (St. John's, Newfoundland and Labrador) 7-6 in an extra end. Edin, Gushue, Howard and Jacobs earned $12,000CDN along with 34.145 ranking points for their quarterfinal finishes. Bottcher went 3-2 in the 12 team round-robin pools qualifying round. In their opening game, Bottcher defeated De Cruz 6-5, losing their next game to Jacobs 7-4. Bottcher lost again to Gushue 8-3, then responded with a 7-6 win over Matt Dunstone (Regina, Saskatchewan). Bottcher won against John Epping (Toronto, ON) 7-1 in their final qualifying round match.